Smartphone and tablet purchases have been on the rise for several years, but 2011 was a turning point: This was the first year that these mobile devices outsold desktop and laptop PCs. The effect — and perhaps some of the cause of this — is a love affair with mobile apps, leading to more apps sold than ever and more time spent with them than ever. We mobile consumers demonstrated this very clearly both in the U.S. and abroad: Apple(s AAPL) this month hit 18 billion downloads total on its iOS App Store, and Google’s Android(s GOOG) Market likewise hit 10 billion. As the year winds down, here’s a look back at the biggest, most significant things that happened in the apps we use on our smartphones and tablets this year, as well as the most important themes to watch out for come 2012. We spent more time in apps than browsing. For the first time ever, we used mobile apps more than opening up a browser window to access Web-based services. Flurry Analytics found that users had crossed over in mid-2011; we spent 81 minutes a day in apps versus 74 minutes in a browser. 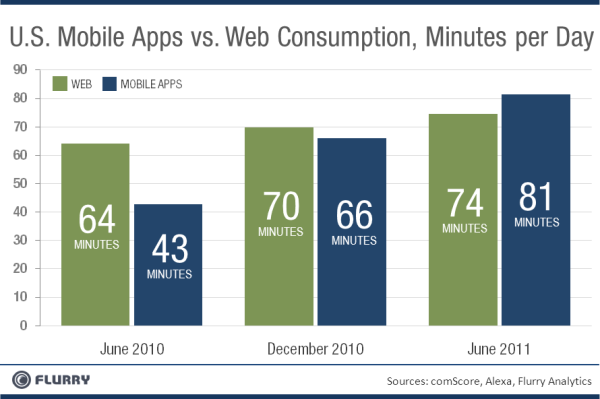 A year earlier, the tally had been an average of 64 minutes in a browser versus just 43 minutes in apps. The iOS App Store proved it is still the place for devs who want to make money. Android phone unit sales are outpacing iPhones, yet two-thirds of the most downloaded apps are free on the Android platform, indicating that users of the Google-powered devices are less interested in buying apps. The developers are the ones who feel this acutely: On average Android appmakers earned 24 cents for every dollar iOS developers make. The app obsession went international. As app downloads grew this year, the percentage of them coming from the U.S. shrunk from 55 percent in January to 47 percent by October. In the meantime, China’s percentage of app downloads skyrocketed 870 percent in 2011, Argentina’s shot up 527 percent and Saudi Arabia’s increased 388 percent, just to name a few, according to Flurry. Apple experienced this same trend with both its iOS app sales as well as its tablet and smartphone sales, as China quickly became its second-most important market in 2011. More HyLoMo everywhere. “HyLoMo” is a cutesy, shorter way of saying “hyper-local mobile,” a concept that’s already being infused into apps, but should take off in a big way next year. The basic concept: Much of our activity is reasonably local — we tend to shop, eat and travel in the areas near to where we live and work. Smartphones already know where we are, so apps and any service can now take advantage of the river of information that’s now available from a variety of sources about where we tend to go, what we tend to buy and what we want to do. “The amount of real-time data that’s available can change apps into being infinitely more useful,” says IMMR analyst Phil Hendrix, who’s researched this HyLoMo trend at GigaOM Pro (Subscription required). Whether that’s searching, making purchase decisions or looking for travel information, both consumers, businesses and advertisers should benefit. Voice-control integration will explode. Apple isn’t the first phonemaker to use voice control or a natural language interface, but the iPhone 4S’s Siri, introduced in October, set off a wave of mainstream interest in the technology. And this coming year we’ll likely see much more about voice-based interfaces from its competitors — Google is reportedly working on its own version. Meanwhile, Nuance (whose technology is used in Siri) just bought rival Vlingo, in hopes of attracting more high-profile customers as “virtually every mobile and consumer electronics company on the planet [looks] for ways to integrate natural, conversational voice interactions into their mobile products, applications, and services,” Nuance CEO Mike Thompson said. NFC grows, but not for payments. It feels like we’ve been betting on NFC for a long time. And in 2012, we’re betting on it again. There’s going to be even more activity, but it will probably not be as much about payments as the other behaviors around paying for things: marketing offers and loyalty rewards/points from vendors. You can already see this in how Google its setting up its Wallet and Offers products. Look for NFC to be weaved also into social networking and contact exchange apps next year. More niche app stores will emerge. The other side of the coin of Apple and Google’s mobile app stores’ popularity is that it’s hard to find good apps. That means it’s more challenging for developers to get noticed. Apple’s tried to deal with this issue through curated lists. GigaOM Pro’s Colin Gibbs says (Subscription required) for Android this will mean more branded app stores, similar to Amazon’s(s amzn). The Android market “is so cluttered” that more app stores within it will emerge, he said, “either as pure retail outlets for niche markets” or companies pushing their own content. Potential examples include Best Buy and Electronic Arts. And there’s also a great opportunity for corporate-focused app stores as well. Thank you Erica for your insight. The growing adoption and interest in voice controlled applications presents a good opportunity to provide value to both the enterprise and the end user by using voice to simplify navigation and search. It is important to consider voice as yet another way users can seek out the information they need or to make it easier for them to take action. Ultimately, a user may end up using a combination of search methods including type, touch and talk during a single interaction. And it doesn’t stop there. Most important is to understand the user’s intent and to present them with a narrow set of choices that address their specific needs. I think you will see two App store types emerge: one is a locally-oriented store, such as SaratogaAppStore.com, which will include some broadly used National Apps like Yelp, which identify local places to enjoy and also local apps like the newspaper apps or similar. The other will be subject-oriented apps, such as GIS or geolocation app stores, or sports-information stores. In many ways, we still haven’t evolved from brick and mortar thinking, if we aren’t purely price-point seekers, we attempt to identify expertise or familiarity within a market and are willing to pay for it or exclude other choices in order to have better knowledge. If the experience in a given focused App store is better, people will frequent it more and might even pay a registration fee or similar in order to get the best of what they want. Siri is a non-starter, it’s like the 2011 Ping- utter failure. Fewer and fewer people are interacting with devices through voice, it’s rude and distracting. Thank you Apple for starting the “App revolution” and fragmenting the web. You have brought us back 10 years. HTML5 and Mobile Web – let’s go! In the mid-90s I spent more time in desktop software than in a browser. Then browsers and the web caught up and my software has dramatically declined. New devices, new software, same outlook. Thank you for your Post, it is relay interesting , Now you can share your posts with more than 41,000 telecom pro world wide on TelecomYou! Community and jobs , join now and share your knowledge : http://www.telecomyou.com ,and we will feature it as part of the week top content at home page and in the newsletter as well. Yeah, you gotta wonder about the moderator if this goes through! Astal investments and software (since 1997) is betting on NFC too. The NFC COUPONS application is already in the Android Market and the full ecosystem for coupons publishers is ready. And what about local or non-corporate app niche appstores? Do you think they’ll emerge? Wouldn’t it be the next logical step to combine voice and data binding to create “new” apps on the fly to get around “apps” overload. If we need a new app for ever small calc we will drown in apps. Might be fun for some people to hunt the perfect one down, but the rest of us just want to get the job done. One might even throw in some NFC for near data acquisition, to bind the data in space time context. Something Google could lead Apple, fragments. Not that owners of older Android handsets can really explain what they expect from future updates. Apart from minor UI tweaks, the new version typically support things that the old hardware can’t do or doesn’t need. Niche app stores will become key to solve the app store search and discovery problem. Human curation vs semantic search – as the number of apps keep increasing, an algorithmic solution is the only way for finding the best apps.